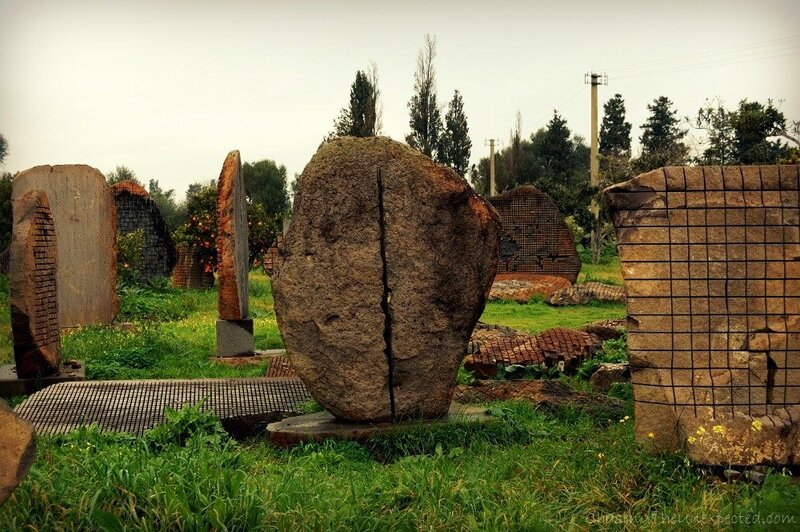 “Do you know that stones bleed?”, worldwide famous sculptor Pino Sciola took me back when I went to see his work in San Sperate, a picturesque hamlet in central Sardinia, Italy‘s second largest island after Sicily. Nestled in the fertile plain of the Campidano, blessed by mild temperatures and soothing sea breeze all year long, Pino Sciola’s workshop is an open-air museum. This is precisely where my homemade Sardinia guide would start from. By making special cuts to different types of stones, Sciola makes sound out of stones, a harmonious, eerie sound reminding of the origins of the stone itself. Basalt? The deep tones of volcanoes from which Sardinia itself originates. Limestone? The melody of fossilized water. 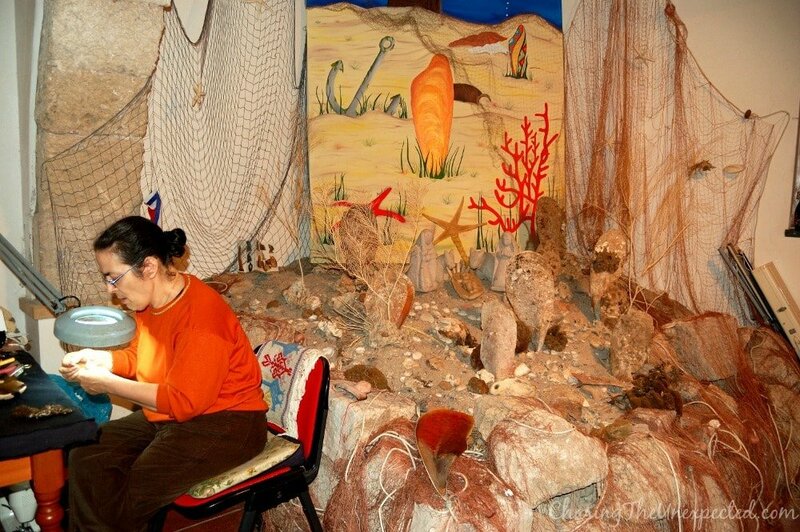 By making you listen to the notes of apparently dead matter, the artist takes you on a virtual trip around Sardinia, where rocks are the cornerstone of its prosperity, history, traditions and natural heritage. To give your Sardinia holidays the right boost, don’t miss out on the most traditional places. 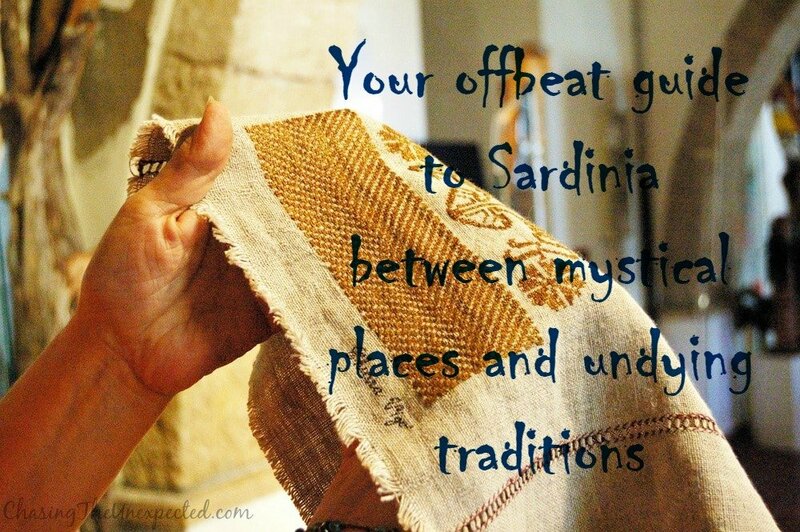 From Pino Sciola’s otherworldly dimension, I’m writing here a small offbeat Sardinia guide I personally followed. I hope it will inspire you to embark on a holistic trip throughout the island and will help you best enjoy and understand local traditions, heritage, and people. ⇒ Tip: Rent a car to travel around and better explore Sardinia! If you are familiar with Europe at all, or you have already experienced traveling to Italy, you will quickly realize this island is nowhere near what you’ve already seen, and that’s also why a guide to Sardinia is essential not only to get by but also to understand the place. An amazing resilience to the globalizing winds of change will result in nerve-racking waits for unreliable public transport and will reveal huge desert areas that show Italy’s lowest population density and a highly pagan tradition in which nature still plays the biggest role in the society. This is obviously not a guide to Sardinia beaches: while celebrities, world leaders, and football players usually hit the popular destinations such as Porto Cervo and the Emerald Coast, in-the-know travelers appreciate the hidden gems that make Sardinia’s seductive character. The impressive variety of traditions, languages, costumes and natural landscapes makes it possible for many to define the region a Continent on its own, and us natives inevitably put on royal airs when the term makes its way in the discussion. The island, “lost between Europe and Africa and belonging to nowhere”, as English writer D.H. Lawrence liked to describe it in the early twentieth century, has been the cherished target of all foreign rulers, although “they say neither Romans nor Phoenicians, Greeks nor Arabs ever subdued Sardinia”. The stormy past of this Italian island makes it an overwhelming destination for history buffs and an endearing cluster of heritage sites and ancient traditions proudly preserved by its inhabitants. Mesmerized by Sciola’s ability to evoke life out of stones, I resumed my own journey along our primeval rituals, myths and wisdom. From north to south, Sardinia’s rugged spine and massive mineral presence is what gives the island both breathtaking views and a mysterious legacy. One of the first things visitors notice when they land here, apart from the fact that animals will have right of way, is that the whole territory is dotted with rudimentary stone buildings. While they might look now elementary constructions, in origins they were the main fortresses and houses of the island’s first inhabitants, the lost nuragic civilization, dating back between 3000 and 4000 years ago and considered by some to be the real Atlantis as described by Greek philosopher Plato. 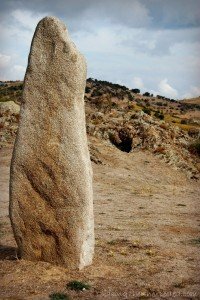 When you feel you have reached the beginning of human history, in Sardinia you can still carry on and linger in cultures well prior to any lost civilization literature has told us about. 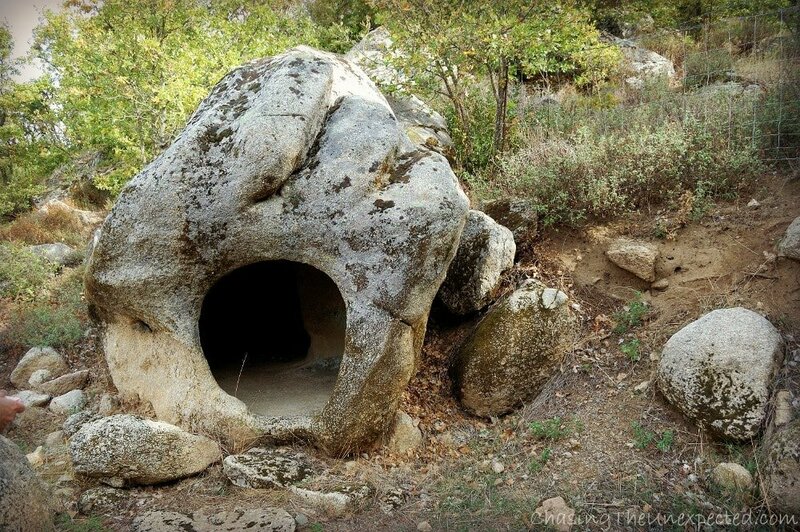 Dating back to some 6000-10.000 years ago, in fact, are other stone structures of unusual forms, imbued with magical meaning and visibly worship places where communities of ancient dwellers performed their spirituality. Giants’ Tombs, Fairies’ Houses and huge standing stones (Menhir) clothe the island along with its olive, juniper and oak trees, surrounded by the unique atmosphere of season plants and colors, enriched by the tangy smell of myrtle and mint that impregnates the air. Although the whole island boasts an impressive collection of such stone buildings, the least conquered and most original place to admire their majesty and step back in their mysterious time is the Barbagia region. Here the small town of Mamoiada enshrines much of the island’s lost jewels, perfect hint of why Sardinia lies “outside the circuit of civilisation” and why natives’ eyes look as “before the soul became self-conscious: before the mentality of Greece appeared in the world,” or so wrote Lawrence. Of seemingly unfriendly natural landscape, Barbagia is possibly the most controversial region of the whole island. Proud and independent, its natives have always fought against all attempts of occupation, they have been called bandits and eventually have become such, making their towns centers of blood feuds for decades. Opposed to what it might seem at first sight, natives of this area are famous for their hospitality: guests are sacred, and so I felt as soon as I stepped over Mamoiada’s imaginary threshold, ready to witness a 2000-year old propitiatory ritual aimed at appeasing the gods still performed today as it was at the beginning. The town teems with visitors, both foreigners and locals, and this is why our Sardinia guide couldn’t miss it. 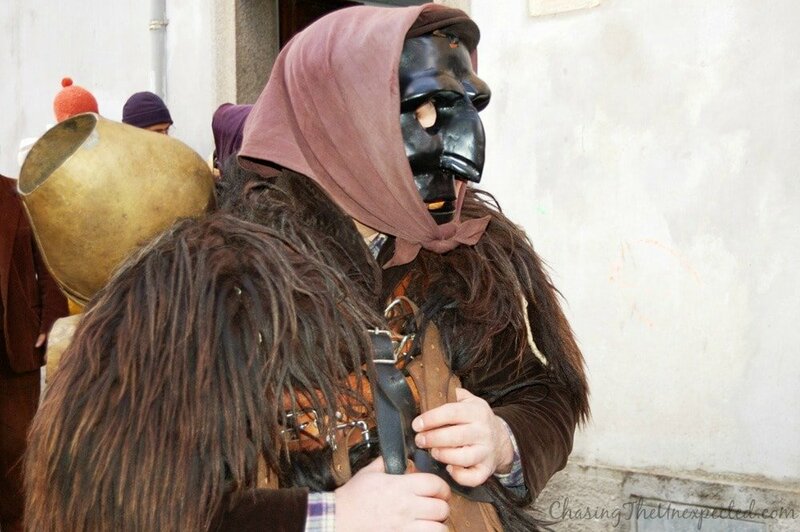 Most tourists are attracted to Mamoiada to see the masks of Mamuthones making their first appearance of the year on January 17th in honor of Saint Anthony. The same masks will come out again a couple of weeks later during the Carnival, and this is precisely the occasion that made me realize how ancient and modern are intertwined in this little village. Townspeople were either filling the streets or standing in typical wrought-iron balconies overflowing with all sorts of flowers to celebrate and assist the passing of these purposely ugly and powerful entities representing our ancient spirits, invoked at the end of the cold season to plead with Mother Nature for giving us a good harvest. Same masks, same ritual, same dance and same haunting bells noise to ward off bad spirits as it was 2000 years ago. Their heavy costume requires strong men to wear it and it’s strictly made with black sheepskin because animals have always been very important in rural communities. “Animals were always sacrificed during worship rituals because it was believed that when their blood dropped on the ground, its contact with earth would beget new life,” I’m told. What appears today an unseemly abruptness, back in time was the natural flow of life, a tough living that left little occasion for rest and leisure time, in line with the harsh-looking landscape of stark headlands raggedly outlined against a blue sky that make the view ravishing and intimidating at the same time. When I left those mountains and their heavy legacy I was a little more aware of my roots and of what could have been living when mankind depended on natural forces rather than a laptop. S’Ortensia, a beautiful B&B located in the city center where I stayed myself for two nights. New, comfortable and with a delicious homemade breakfast, I recommend this place without any hesitation. Click here for more information on availability and prices. Slowly, following my own personal guide to Sardinia, I made my way southward, towards softer lands, to meet another person that contributes in making the island unique, Chiara Vigo, the only woman in the world who still weaves the byssus, the silk of the sea, as they used to do in ancient Mesopotamia and around the Mediterranean countries some ten thousand years ago. The byssus is a fine fabric obtained from the velvety strand secreted by the noble pen shell, an endangered fan-shaped mollusk native of the Mediterranean seabed. The finished product would cost up to 500,000 euro, but like for every true legend, there is the trick: selling is off the table. Chiara in fact and all her family members before her took an oath: the byssus cannot be sold nor used for personal gains, it belongs to everybody, like the sea. A traditional heritage deeply intertwined with what Mother Nature has blessed this small piece of land with is what best identifies Sardinia’s past and present. After some seventeen years living either in Rome or abroad, going back to my hometown always feels like opening a treasure trove that, gem after gem, releases the primordial spirit of an island that was already there before the beginning of times. Hotels in Sardinia, where to stay in Sant’Antioco? Family-run B&B, La Pineta offers a lovely terrace with a breathtaking view. With an interior completely in Sardinian traditional style, all comforts and facilities such as free WIFI, private bathroom, and satellite TV are provided. Click here for more details on room availability and current rates. You can’t say you have experienced Sardinia if you haven’t blended with locals in one of the many festivals that reconnect the island with its most remote past and spirituality. With the advent of Catholicism, pagan rituals were incorporated into the new religion, or at least that was the trend. However, still today, all festivals in Sardinia retain much of their ancestral charm of living in direct contact with the earth, considered the true source of life and wealth. A constant spirit of recklessness and a defiant attitude towards danger are the standards to understand local festivals, from north to south, all along the island’s barren mountain ranges, its winding rivers and soft rolling hills. 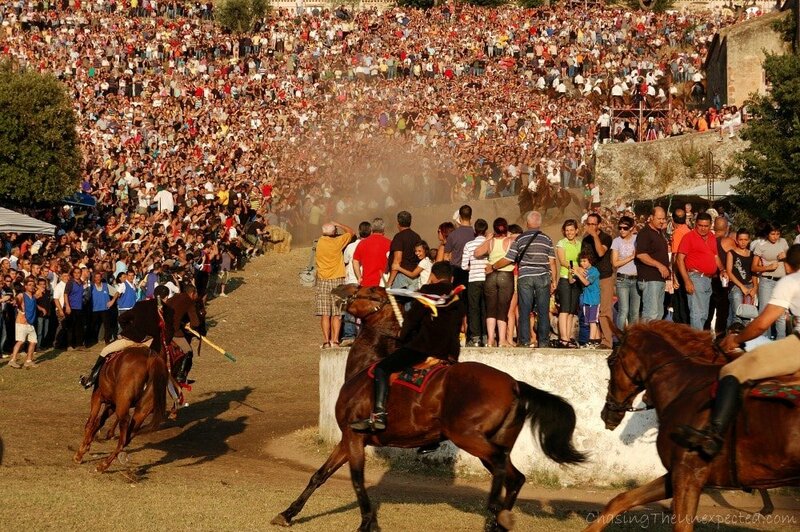 Arguably the most dangerous horse race in all of Sardinia is S’Ardia and happens every 6th of July around 7 pm in Sedilo, a small town in Oristano province, the very heart of the region. Like pretty much all other festivals, this one too loses its origins in the mists of time and while now the main interpretation wants it as a commemoration of the Milvian Bridge battle that saw Emperor Constantine victorious against Maxentius in 312 AD, it was certainly born as another pagan ritual. The first three horse riders running the race embody the Emperor and his generals, followed by three guards fiercely protecting them against the enemy fury composed by a hundred of other horses. This suggestive race never fails to attract thousands of pilgrims and tourists every year, who stand for hours in the sun-drenched field around the sanctuary where the race takes place holding their breath until it’s over and it’s announced that nobody got hurt. Because one of the main ingredients of the adrenaline overdose is the path filled with pitfalls and the inevitable accidents that happen every year despite the top-notch riders being the best on the island. Hotels in Sardinia, where to stay in Sedilo? Catedda B&B is comfortable, of simple decoration and will make you experience a truly traditional lifestyle. All rooms have a private bathroom and guests can enjoy relaxing in the garden. Click here for more information on room vacancies and latest prices. A land steeped in mystical tales, magical corners and mysterious personalities that becomes utterly beguiling once you explore it beyond its tourist draws, Sardinia not only has dazed travelers and writers for years but also attracted foreign colonizations for centuries, each of them leaving their own imprint in what is now a fascinating blend of undying traditions, mystical places, and seductive views. I love my hometown, but I don’t shy away from its weaknesses, one of the biggest being the absolute inefficiency of its public transport. This is the reason why either you visit Sardinia to enjoy a cycling holiday or you will definitely need to rent a car. Many are the car hire companies you will find at Cagliari, Alghero and Olbia airports after you land. Click here for more information on availability and latest prices for the available car rentals. Sardinia is connected to many European capitals and main cities with direct flights operated by most European airlines such as Alitalia, Easyjet, Ryanair, Volotea, Lufthansa, and others, depending on where you are departing from, or come by ferry. Through the search engine below, you can book your ferry to any city in Sardinia, be it Cagliari, Olbia, Porto Torres, Golfo Aranci, Santa Teresa and even Arbatax, from whatever city you are at, either Rome, Barcelona, Bonifacio, Ajaccio, Genova, Livorno, Marseille, Nice, Toulon, Palermo or Savona. Will be honest with you: I didn’t think I would read through all the article (even though it is about Sardinia) but I couldn’t help myself going on and on. So congrats for your blog and especially for this article! 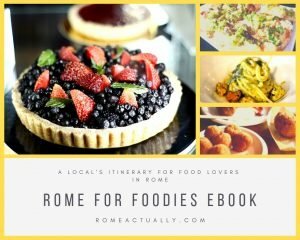 Thank you for your kind words, I’m from Sardinia myself, this is why I love writing about it :) You have a pretty cool blog yourself, well done! Looks amazing! I’ve been to Sicily but not Sardinia…it’s now on my list! Is there a shop in Sardinia that sells embroidery items or where you can take a class. We are a group of women traveling on a cruise and stopping there and we all embroider and would love to see some works and be able to take a class. Hi Gwyn, where are you stopping with the cruise? I don’t know of any embroidery class but there are many shops selling handicraft.